50 & 55 South Essex Avenue is a mixed-use, mixed-income development located on two lots flanking South Essex Avenue adjacent to the main train station in the City of Orange Township. Until January 2013, the sites featured an unoccupied warehouse and coal storage facilities. The lots are now home to 72 high-quality and attractive rental apartments as well as nearly 10,000 square feet of ground floor retail along with parking and bike storage. Five of these units are set aside for participants of a Volunteers of America initiative which focuses on youth aging out of foster care, including a full-time onsite services coordinator. A resident superintendent and onsite Property Management staff are also part of the property’s support. Additionally, NJ Green Futures and Energy Star program requirements guided selection of appliances and systems to optimize energy efficiency, and instituted maintenance and operations protocol to ensure continued “green building” standards. 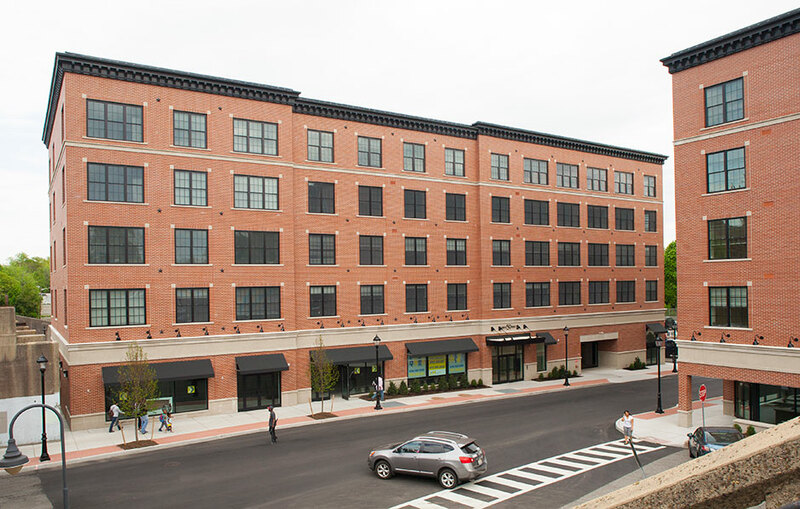 This Orange neighborhood is undergoing a dramatic transformation around the New Jersey Transit Orange train station and Downtown areas, of which this transit-oriented development is an integral part. The renovation includes linking this site between two others, thus establishing a significantly more pedestrian-friendly path while connecting previously disparate areas along a corridor that extends past the freeway and up to Main Street. In addition to train commuters, students also pass the development on a daily basis on their way to and from Orange Middle School and High School. The site improvements – attractive landscaping, widened sidewalks, and ample street lighting – aim to increase safety for all those traversing the Transit Village. The emerging street-wall intends to capture the attention of the commuters and students on their way to and from downtown and entice them to reconsider the location as an area in which they would happily spend more time. The first business to take root at 50-55 South Essex Avenue in New Jersey is a preschool. L+M Development Completes first NJ Project in Orange.